My sister Kelly died on September 11th of this year, eight days before what would have been her 45th birthday. Cancer killed her. Her disease was first diagnosed over four years ago, and her case was deemed terminal from the outset (the cancer, which originated in one of her breasts, had already spread into her bones by the time it was detected). After the diagnosis, and following some preliminary treatments, the cancer was dormant for over two years. But the disease became aggressive around the beginning of this year. By Easter Kelly's condition was labeled serious; by late August the hospital staff attending to her informed us that she was “in danger all the time now.” She fell asleep at around 11 p.m. the night of September 10, with our mother at her bedside; she would never be fully conscious again. At 8:38 the following morning she stopped breathing altogether, her hands being held at her last moment by our father and sister, Karen. Amongst Kelly's final wishes was the request that the family hold a memorial service to remember her after she died. Since she was being cremated, there was no question of an open casket ceremony of any kind. The family was simply to gather together somewhere (Kelly did not make any suggestions as to where this should happen) and talk about her. Initially there was some discussion about doing this informally, possibly at a public park or on the beach (most members of my family live in Virginia Beach, and that is where Kelly spent the majority of her life). But the day after Kelly died my mother came to the conclusion that a gathering in a place like that would not be right. She felt that we needed to memorialize Kelly in a more formal setting, to do her life, and our thoughts and words about her, justice. We wound up renting the chapel at the same funeral home that was handling Kelly's cremation. The days I spent at my mother's house after Kelly died are a time that will always stand out to me as one of the most memorable events of my life. Grief, despair, and regretful thoughts were intermingled with joy, a sense of closeness to others, and clarity of thoughts and feelings. I, along with my wife, Abby, and our two-year old daughter, Violet, live only a three-and-a-half hour drive from Virginia Beach now, and I have never lived farther from my home than that since leaving the Tidewater area for good, thirteen years ago. Over those thirteen years I have visited my family often, generally with Abby and, for the last two years, Violet. But I have never stayed at my mother's house for more than a short weekend in all that time. Abby and I both lead hectic lives, always have, and now we have a daughter to take care of and no immediate family nearby to help out, the way family members can do for one another. Our visits to Virginia Beach have been limited to the occasional, and abbreviated, weekend trip. So when I stayed in Virginia Beach from Monday afternoon until late morning on Friday, this was the first time I had spent a succession of days there in thirteen years. There is a level of bonding that you simply cannot get from a 24-hour visit with people. With various family members coming in and out of my mother's house, and with events like lunch and dinner - not to mention Violet's nap, and the whole process of getting her ready for bed in the evening - to be attended to, there is much activity and little time to simply sit and talk to anyone for any considerable amount of time. I have always left those weekend visits with a sense of disappointment, like I once again didn't quite connect to anyone in my family when I had them right there in front of me. When Abby and I first learned of Kelly's death, we made the decision that I would go to Virginia Beach alone at first; she and Violet would follow later in the week. I drove straight to the hospital where Kelly had died, and where she had spent the last month of her life. My mother and father, who divorced when I was a senior in high school - Kelly, four years older than me, being in her early twenties at that time, had asked the hospital staff to allow Kelly's body to remain in her bed until I arrived, so I could say a final goodbye to her. My mother and Amy, Kelly's daughter, now 23 years old, and a mother herself, were waiting for me outside the main entrance to the hospital. The three of us hugged one another for several minutes, and cried together, before walking into the building. Then we all entered Kelly's room. After a few minutes of us all standing in there, I asked my mother and Amy to allow me to have a few moments with Kelly alone. I had not looked at a dead body since a few of my relatives died when I was in high school, and I had never seen a dead body that had not been prepared for a viewing by funeral home personnel. When I looked at Kelly I saw that she was already gone; her spirit was someplace else and what lay before me was simply her shell. It felt somewhat macabre, a little disconcerting. Still, I held one of her cold hands, and I cried, and I told her some of the things I wished I had said to her more often when she was alive. So much happened over the next four days, it's hard to know where to start in describing it all. There are moments, and sometimes strings of days or weeks, or longer times in life when you feel that you have been transported from the everyday world to a place that is less real. I had felt that way at other moments in my life: the day my brother Ronnie, who I had shared a bedroom with for seventeen years, left home for college; when I myself left home for the first time; the day Abby and I were married; the days surrounding Violet's birth. Being around my family after Kelly's death was a different kind of time than any of those experiences, but what they all share in common is a dream-like quality. There was a lot of activity involved in making arrangements for Kelly's service. A music enthusiast my entire life, I volunteered to put together a tape of songs to be played at the service. Karen was especially helpful to me in this endeavor, telling me about some songs that had always meant a lot to Kelly, including a few which the two of them had sat together and listened to many times over the last weeks and months of Kelly's life. My mother, Karen, and Amy put together two collages of pictures of Kelly, to be displayed at the service. We all, including my father and Ronnie, who arrived from Florida, along with his wife, Beth, and their two daughters, Abby and Emma, Monday evening, had a hand in writing the obituaries - two of them, because we came to feel the original obit was not complete, and we wrote a second, more thorough one, which ran in the newspaper two days after the original did. There were times when we had to do mundane things, like talk about what to have for dinner and make runs to the store for various things; but even those kinds of activities seemed to have a spiritual quality about them at the time. Grief comes to people in waves. When you lose someone close to you, you don't cry about it all at once. Something causes you to be hit in a certain way by the realization of the loss of this person, you break down, eventually the sensation lifts a little and you go back to feeling in a more normal way. Then, some minutes, hours, or days later, you get hit with another wave of the grief, and you go through the whole process again. What I loved about my family, and the way we were together that week, was how we were all there to comfort one another when one or more of us got hit with a wave of grief. I would be buzzing around, getting food together or recording the music for the service, and would come upon Amy or Karen or Junior - Kelly's son, 26, and also a parent - and find them with their heads hung and tears in their eyes. I would sit with them and encourage them to tell me the particular thought or thoughts they were having about Kelly at that moment. They would do the same for me when I experienced a wave of the grief. I know it helped each of us to be able to share all of this with one another. There is one moment that stands out to me as the one I will probably remember most vividly from the events of the week. My mother and I were sitting in her living room the day before the memorial service, me putting the finishing touches on the music collection, and my mother cutting out pictures of Kelly to be included in the collages. I put on Judy Collins's version of “Amazing Grace,” and as the song played, and as I was fishing around in my CDs for the next song to put on the tape, I heard the sound of sobbing. I turned around and saw that my mother had dropped the picture she had been holding and was crying. When my mother cried that week, her cry was one that sounded like it was coming from a place far down inside her; it was primal, something like the howl of a wounded animal. She was crying like that at that moment. I went over and sat next to her on the couch and put my arm around her, meaning to comfort her. But then I started crying myself, and she had to stop and comfort me. Amy heard us both crying and she came out from wherever she had been in the house and sat with us. Soon the three of us were holding one another and crying together for the second time in forty-eight hours. Kelly's memorial service was held on Thursday afternoon. We decided not to have a minister or any other type of official speak at the service. Those of us in my family merely gathered together, along with some friends and other well-wishers, at the chapel. We looked at the collages of pictures of Kelly, we listened to the music I had put on the tape, we talked amongst ourselves, and a few of us got up on the chapel's little stage and made short speeches. My mother read part of the bible passage that has the theme of “To everything there is a season.” She then went on to talk about what a fighter Kelly had been, how she had battled the many difficulties in her life with such fierceness. Kelly suffered from bipolar disorder, which originally manifested itself when she was around 22. Her first nervous breakdown occurred sometime shortly after Alan – her husband, and Junior and Amy's father – abandoned the three of them, when Junior was three and Amy was a newborn. None of this is to mention Kelly's childhood and teenage years, all of which was extraordinarily difficult. My father talked about his last conversation with Kelly, a discussion they had the afternoon of Sunday, the day before she died. In that conversation, Kelly – who had suffered so much throughout her life, who knew she was about to die, and who was at that moment in unimaginable pain from all the damage the cancer had done to her body – was thinking of others, not herself, and of the future. She asked our father where all the love in the world had gone, and she told him that a final wish she had was that the rest of us in the family would start coming together more, supporting one another more, instead of fighting amongst ourselves and being distant from one another. Ronnie read part of a poem that held special meaning to Kelly. The poem is engraved on a plaque that Kelly gave to Karen shortly before her death. The theme of the poem is believing - in oneself, in others, and in the goodness of the world at large – particularly in times of struggle. Karen herself seemed to want to get up and say something to all of us about Kelly, but after going back and forth about it, she finally opted not to make the speech. I did a talk that had a couple different parts to it, all of these thoughts having come to me over the three previous, mostly sleepless nights. The crux of my speech, and the part of it that I was unable to get through without falling into a fit of sobbing on the stage, was about how the love I had always showered on Junior and Amy was simply an extension of the love I felt for Kelly, their mother, who I was rarely able to act loving towards while she was alive. At one point while I was speaking Violet broke away from Abby, ran up to the little stage, and saw me standing up there in front of the microphone. After staring at me wonderingly for a few moments, she yelled, “Daddy!” It was a cute moment and it supplied a kind of comic relief, and in an odd way was what enabled me to get through my speech, which was hard to do because of the emotional way I was feeling, and the weight of my words. After the service we all went to my mother's house, where we ate, drank, and talked. The kids – Violet, Ronnie and Beth's two daughters, Junior's daughter and Amy's son - played games together. Some of us half-heartedly watched a college football game on TV. We were all exhausted, and still grieving, yet there was a sense of relief around the house. When it was time for Abby, Violet, and I to leave Friday morning, I found it hard to go. This was as close as I had been to my family since leaving home more than a decade before - actually, it was probably as close to them as I had ever felt - and I wasn't ready to walk away. Also, because we were all still so sad about Kelly being gone, it felt wrong, unnatural in a way, for me to be leaving them then. They still needed me, and I still needed them. Life pushes us forward, though, no matter what events come up and make us want to stop in our tracks. Abby and I have a house to take care of in Durham, North Carolina, and we have jobs here, and friends, and two cats . . . We had been away too long, and needed to get back home. I cried as I said goodbye to Amy, Karen, and my mother. Ronnie and his family had already gone back to Florida by then, my father and his wife, Pam, had returned home to another part of Virginia, and Junior is a late sleeper who was still in bed. Karen and I hugged each other more tightly than we ever had. It was so hard to leave them that day, yet for the first time that I could remember, when we left Virginia Beach I didn't have that hollow, disappointed feeling I usually felt as we drove away from there on our weekend visits. I hadn't failed to connect to my family this time. I felt close to them now, close in a permanent way. And even though I was sad about leaving them, I also felt satisfied that I had gotten into their hearts, and they into mine. I wondered if Kelly was sitting in a peaceful place somewhere, watching all of this. I hoped she was, because if she could have seen us all that week, and if she could have read my thoughts as I was leaving, she would have known that we had begun to grant her last wish, the wish about all of us getting closer to each other and starting to act more like a family. 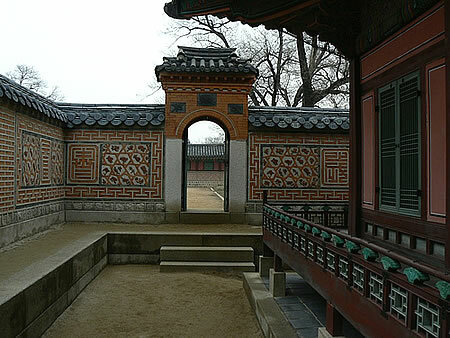 This photo was taken in February 2007 at the Imperial Palace in Seoul. I shot it on the grounds of the palace behind one of the imperial cemeteraries. There are many sections of the palace, each with its own unique architecture, color and design. This courtyard featured a gateway into another series of courtyards in the rear of the palace before the gardens.